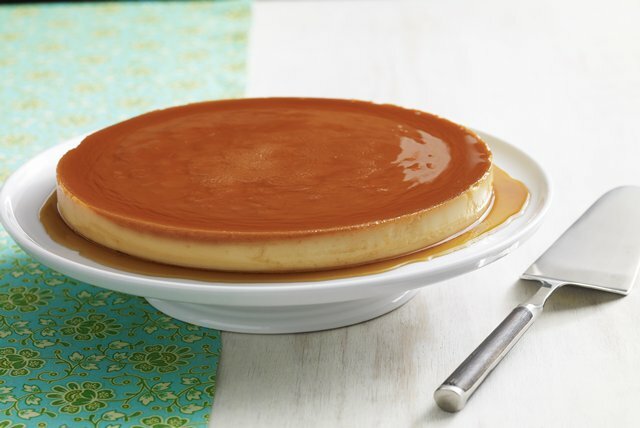 Fulfill your every flan-tasty with our Cream Cheese Flan Recipe. Watch now to learn how to make this crowd-pleasing Cream Cheese Flan Recipe today. Cook 1 cup sugar in small saucepan on medium heat until melted and deep golden brown, stirring constantly. Pour into 9-inch round pan; tilt pan to evenly cover bottom with syrup. Blend milk and cream cheese in blender until smooth. Add remaining sugar, eggs and vanilla; blend just until smooth. Pour over syrup in pan. Place filled pan in larger pan; add enough hot water to larger pan to come halfway up side of small pan. Bake 50 min. to 1 hour or until knife inserted near center comes out clean. Cool slightly. Carefully remove flan from water; cool completely on wire rack. Refrigerate several hours or until chilled. Unmold onto plate just before serving. Sweets can add enjoyment to a balanced diet, but remember to keep tabs on portions. One serving of this flan is 1/2 cup. Serve topped with 1 cup mixed fresh berries, such as raspberries and blueberries. Bake and refrigerate flan as directed. Run metal knife around edge of flan. Invert onto plate; shake gently to loosen. Gently twist to remove pan. To soften any remaining caramel in pan, dip bottom of pan in hot water; spoon caramel over flan. When serving adults, prepare as directed, omitting vanilla and adding 1/4 cup BAKER'S ANGEL FLAKE Coconut or 1/2 cup coconut milk, and 1 Tbsp. rum to cream cheese batter before pouring into prepared pan. Prepare as directed. Choose one of the following options: Guava: Add 1/2 cup guava paste, cut into pieces, or 1/2 cup canned guava shells in heavy syrup to cream cheese batter before pouring into prepared pan. Lime: Add zest from 1 lime to boiling sugar mixture; remove from syrup before sugar caramelizes. Pour into prepared pan as directed. Cajeta: Add 1/4 cup cajeta (Mexican goat milk caramel) to cream cheese batter before pouring into prepared pan. Chocolate-Orange: Add 2 oz. BAKER'S Semi-Sweet Chocolate, melted and cooled, and 1 Tbsp. orange zest to cream cheese batter before pouring into prepared pan. Coconut: When serving adults, omit vanilla. Add 1/4 cup BAKER'S ANGEL FLAKE Coconut or 1/2 cup coconut milk, and 1 Tbsp. rum to cream cheese batter before pouring into prepared pan. Prepare as directed, adding 1/2 cup guava paste, cut into pieces, or 1/2 cup canned guava shells in heavy syrup to cream cheese batter before pouring into prepared pan. Prepare as directed, adding zest from 1 lime to boiling sugar mixture; remove from syrup before sugar caramelizes. Pour into prepared pan as directed. Prepare as directed, adding 1/4 cup cajeta (Mexican goat milk caramel) to cream cheese batter before pouring into prepared pan. Prepare as directed, adding 2 oz. melted BAKER'S Semi-Sweet Chocolate, cooled, and 1 Tbsp. orange zest to cream cheese batter before pouring into prepared pan.